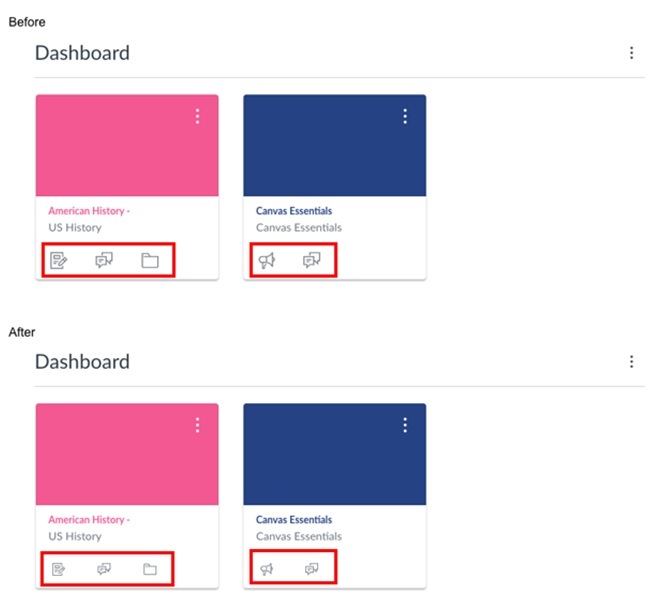 These are the latest Canvas system updates that will become available on 9th March 2019. Please click on an update to expand and view the information. If you have any questions please submit a support ticket via the help menu in Canvas. Update 12th March 2019: Updates 4 – 7 are now also available in Canvas. Update 1: Discussions – Author Search Functionality. This update is available for all Canvas roles. Users can search discussion topics by author name in addition to title. This change restores previous author search functionality within the Discussions page. When viewing the Discussions page, users can use the search field to search for a discussion by title or author. The Search field help text has been updated to specify the search options. Any discussions that have been copied from a previous course do not include an author. · How do I view Discussions as a student? · How do I use the Discussions Index Page? · How do I create a discussion as an instructor? Update 2: Dashboard - Course Card Icon Size. This update is available for all Canvas roles. The icon class displayed in course cards defaults the icon display in a slightly smaller size. This change provides consistency for icons in both the Card View Dashboard and the List View Dashboard. Users who have enabled course cards in the Dashboard can view the course card icons in a slightly smaller size than previously displayed. No functionality has been affected. · How do I use the Dashboard as a student? · How do I use the Dashboard as an instructor? Update 3: Commons - Favorites Removal Confirmation Message. This update is available for the following Canvas roles: Teacher, TA and Course Designer. The Remove from Favorites confirmation message has changed from an animation on the resource card to a confirmation message in a separate browser window. This change improves accessibility within Commons. When instructors remove a resource from their Favorites, the confirmation message displays in a separate browser window. No functionality has been affected. • What is Canvas Commons? • How do I add and manage Favorites in Commons? Update 4: Commons - Favourites and Downloads View/Sorting. This update is available for the following Canvas roles: Teacher, TA and Course Designer. Resource cards display the number of times a resource has been downloaded or imported and the number of times a resource has been favourited. Users can also sort search results by Most Favourited and Most Downloaded. This update allows instructors to easily view how many times a resource has been favourited and downloaded. It also allows instructors to sort search results by Most Favourited or Most Downloaded. The resource card displays the number of times a resource has been favourited and downloaded, allowing instructors to easily find content in Commons. Instructors can also sort search results by Most Favourited or Most Downloaded. · What is Canvas Commons? · How do I use Commons? · How do I preview resources in Commons? Update 5: Commons - Institution Search Results. This update is available for the following Canvas roles: Teacher, TA and Course Designer. When viewing the Resource Details tab in Commons, users can view filtered search results that only display resources from the same institution. This update allows users to find resources from the same institution as the resource they’re currently viewing. When an instructor views the Resource Details tab for a resource in Commons, they can click the Institution name to view filtered search results that only display resources from that institution. Update 6: Commons: Resource Card Improvements. This update is available for the following Canvas roles: Teacher, TA and Course Designer. This update includes several changes to the interface of resource cards in Commons search results. The updated resource cards now show updated icons, resource type, grade level, and the number of times a resource has been downloaded and added as a favourite. This update simplifies the information displayed on the resource card. The updated resource card displays in the Commons search results and in the Favourites page. Update 7: Commons Favourites Importing. This update is available for the following Canvas roles: Teacher, TA and Course Designer. Instructors can view and import content from their Commons Favourites list directly in the Rich Content Editor in Canvas. This feature allows instructors to import favourite content from Commons directly in their Canvas course. Instructors can use the Commons Favourites button in the Rich Content Editor toolbar to import favourite content from Commons. Any supported content added to the Favourites list in Commons are available for import in the Rich Content Editor. Users can search for items or filter by content type within the sidebar. Users can only import embeddable content types (documents, videos, audio, and images). · How do I add and manage Favourites in Commons? · How do I import Commons Favourites in the Rich Content Editor in Canvas? Other recent updates: Canvas Integration - Turnitin LTI. 22nd February 2019: Problems with One Drive upload have been resolved. This update is available for the following Canvas roles: Student. 15th January 2019: Change the visibility of QuickMark sets. This update is available for Instructor roles in Turnitin. Turnitin comes packed with many QuickMark sets that help to make marking easier. However, not every set will be relevant to every Instructor. You can now change the visibility of QuickMark sets with just a few clicks. For more information please see the following guide: Changing QuickMark set visibility options.